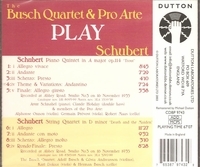 "The Pro Arte Quartet was founded in 1911-12 by students at the Brussels Conservatory. Violinist Alphonse Onnou was the leader, and the other founding members included Laurent Halleux (violin), Germain Prévost (viola), and Fernand Auguste Lemaire (cello). The Quartet made its début in Brussels in 1913 and soon became known as an exponent of modern music. In 1918 Fernand Quinet became the cellist, but in 1921 he was replaced by Robert Maas. That year, with the aid of Paul Collaer and Arthur Prévost, the Pro Arte Concerts began, in which performances were given of new works by, among others, Bartók (whose Fourth Quartet is dedicated to the Pro Arte), Casella, Honegger, Martin, Milhaud and Rieti. The Quartet performed with great success at the 1923 ISCM Festival in Salzburg, and the same year played new works commissioned by Elizabeth Sprague Coolidge at a concert in Rome. After touring Europe the Quartet visited England for the first time in 1925; subsequent visits to England included annual series of a week’s performances in Cambridge (1932–8). In 1932 the quartet was granted the title Quatuor de la Cour de Belgique, in recognition of its services to Belgian music. The Pro Arte played their American début in 1926, performing at the inauguration of the Hall of Music in the Library of Congress, Washington, DC. They returned for thirty tours to the United States, as well as a tour of Canada, often under the auspices of the noted patron of chamber music, Mrs. Elizabeth Sprague Coolidge. Their first visit to Madison was in 1938 where, two years later, the musicians were stranded by Hitler’s invasion of Belgium and the outbreak of World War II. Following their concert on campus, the University of Wisconsin chancellor offered a permanent home to the Quartet – it was the first such residency ever in a major American university, and became the model on which many other similar arrangements were developed at other institutions. Onnou died in 1940, but the Quartet continued until 1947 as Quartet-in-Residence at Wisconsin University, led first by Antonio Brosa and from 1944 by Rudolf Kolisch. The Pro Arte became the faculty string quartet at UW-Madison in the late 1950's, an appointment that continues to the present day."